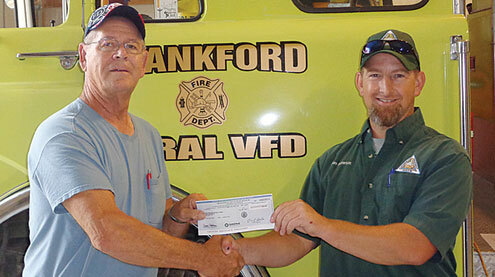 Volunteer Fire Assistance Grant Given To Frankford Rural Dept. During July and August, matching funds grant checks for rural fire departments are being distributed by the Missouri Department of Conservation, Forestry Division staff. One hundred seventy four fire departments are receiving checks for up to $4,000 to help with the purchase of personal protective gear, communications equipment, wildlife suppression equipment to help increase the fire department’s capacity to suppress wildfires safely and efficiently. The total funding awarded to Missouri fire departments through the matching funds grant program this year is $389,603.56. Fire departments are required to match 50 percent of the funds which are provided by the Missouri Department of Conservation and the U.S. Forest Service, Volunteer Fire Assistance Program. Throughout the last 30 years, over $8 million has been distributed to rural fire departments to help them increase the safety of their firefighters and provide them with better firefighting equipment.